Winches are amazing tools but they have their drawbacks. One of these is that it is often difficult to keep tension on the wound up cable without damaging the cable or the point where the hook has been secured. Another drawback is that the cable can become a very dangerous whip when it breaks. 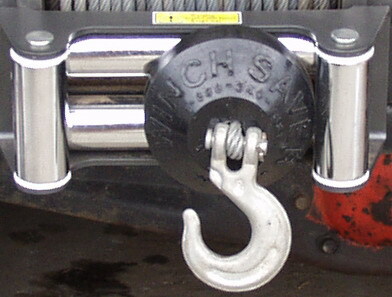 The Winch Saver attempts to solve both of these problems. Winch Saver is a family run home based business from Longville, Louisiana. Charles Kerry, the owner and inventor of the Winch Saver, sent me these photographs of the production of the Winch Savers. So just what is the Winch Saver and why would you need one? 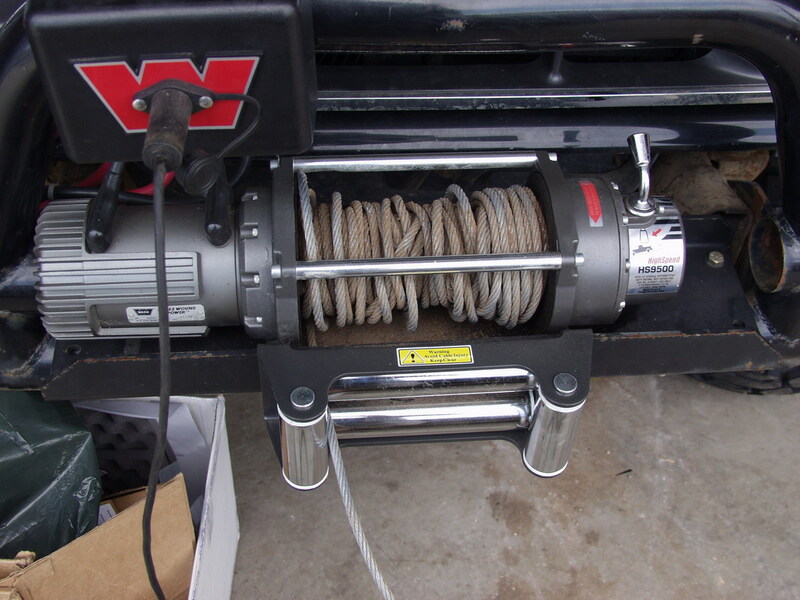 Care and maintenance of your winch cable is the number one consideration in preventing failure. As it happens, cable maintenance is often one of the last things we do. We’ve all done it; hooked the cable onto a part of our bumper or to a tow hook just before the last bit of cable is wound onto the spool. Heck some of us even let the hook get pulled into contact with the fairlead. Up until now there hasn’t been much of a choice, you have to keep tension on the cable and you have to put the hook somewhere. Now with the Winch Saver you can keep your cable tight and avoid damage to your bumper, tow hooks or fairlead, not to mention the wear on your cable from being tightened at a sharp angle. The Winch Saver looks like a big Lifesaver candy and I imagine that has something to do with its name. 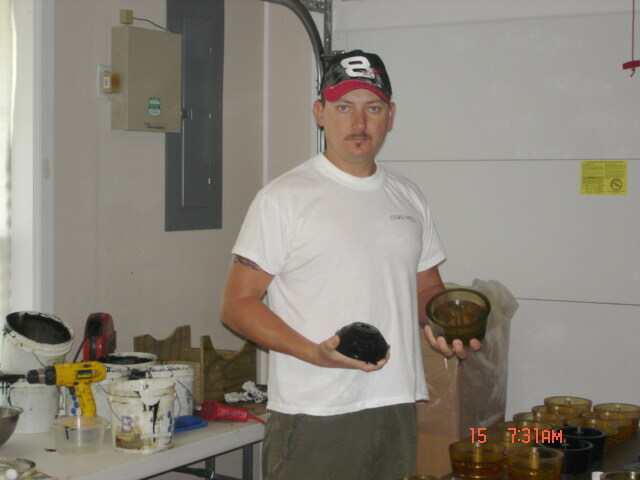 It is a 2” thick, 5” diameter round disc that weighs 2lbs and is made of what appears to be urethane rubber. The original Winch Saver that was sent to me for review was a transparent amber colour and was available in black as well. A harder more durable compound that is only available in black has since superseded it. It is this new version of the large Winch Saver that will be reviewed here. The Winch Saver is currently no longer available in amber. 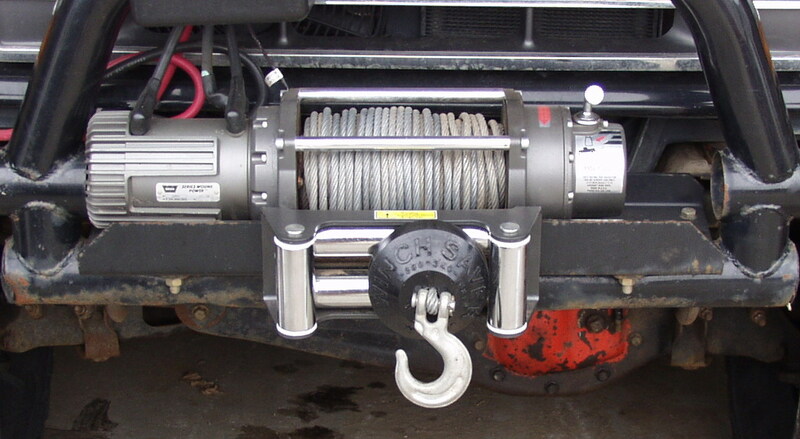 There is also a smaller version available for ATV winches. Installation of the Winch Saver was very easy. I wanted to say that it can be done with basic hand tools but really all that I needed was a pair of side cutters and a flat head screwdriver. To install the Winch Saver I first needed to pull out some slack from the winch. Winch Saver recommends pulling out a couple of feet but I went ahead and pulled out enough so that I could stand comfortably while working. 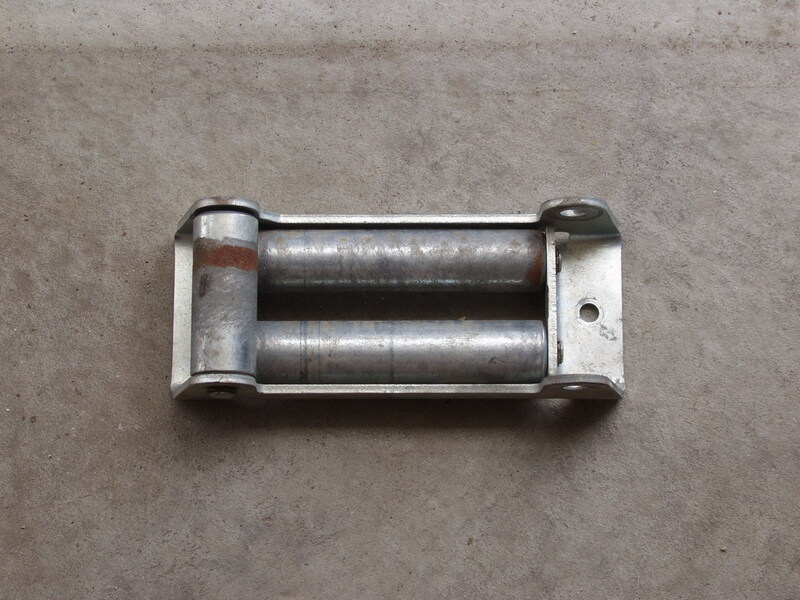 I also installed a new roller fairlead since my old fairlead was quite severely damaged. 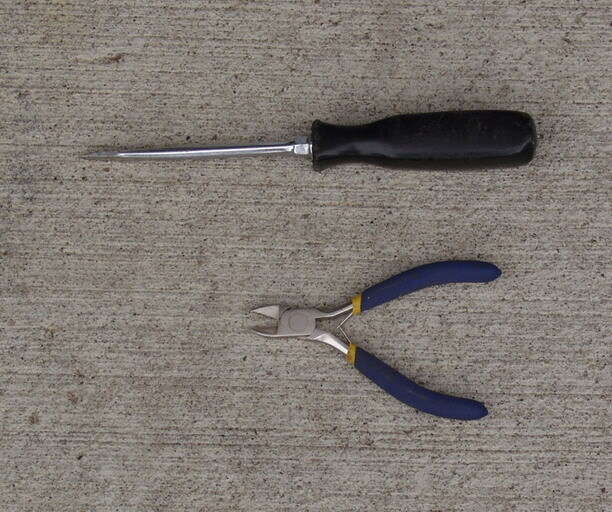 Once I had the hook in my hand I used the screwdriver to get a little clearance between the cotter pin and the clevis pin, I then used the side cutters to straighten out the cotter pin so it could be removed from the clevis pin. The Winch Saver slid easily over the eye and I pushed it down the cable so I could reverse the process to re-install the hook. It was also a great opportunity to re-spool my very messy winch cable. With the Winch Saver now in place I spooled in my cable and as it came near to the end I watched the Winch Saver closely to see what would happen. As the last few feet of cable were pulled in the Winch Saver began to do its thing. The cable tightened and the Winch Saver snugged up to the fairlead stopping the drum with a satisfying groan. Et voila! A nicely wound slack free winch cable that didn’t need to be hooked to anything. I repeated this procedure several times, partly to make sure I could get a good video clip and mostly because it is fun to watch. When the hook makes contact with the Winch Saver, there is a certain amount of deflection but it is surprisingly resilient and appears to stand up very well to compression so I am very hopeful about it’s long term durability. The second function of the Winch Saver is as a weight for your winch cable, to prevent the cable from whipping in the event that it breaks. The most common thing that people do is put a jacket over the cable somewhere near mid span but almost invariably all that this accomplishes when the winch cable breaks is that someone has to hike into the woods to pick up their coat from wherever it has been flung. Other more creative and yet often more ineffective methods are out there. I have watched people dutifully wrap a wet t-shirt around a winch cable, another placed a tow strap over top, still another hooked the ratcheting end of a tie down strap and the piece de resistance was a pair of socks filled with rocks tied together and then draped over the cable. 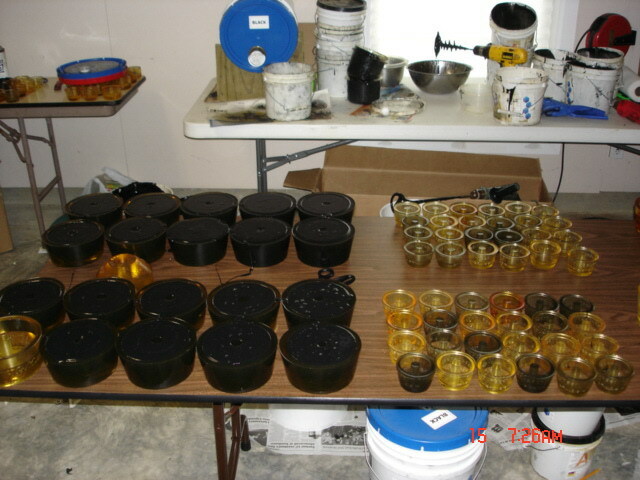 An effective method is a weight consisting of a saddlebag like arrangement that is filled with sand or lead shot and is then hung over the cable, these can be expensive, are often cumbersome, can fall off and, are not always there when you need them. The beauty of the Winch Saver is that it is small, compact, inexpensive and most importantly, always there on your winch cable ready to go whenever you need it. I expect that there is sufficient mass in the Winch Saver to stop a winch cable from flying away out of control. However, since testing this would require a catastrophic failure of the winch cable or tow hook I am not willing to prove this theory intentionally. I will post an update if or when I have the occasion to prove or disprove the value of the Winch Saver as a winch weight. Thank you to Charles Kerry of Winch Saver for providing me with these products for review.